Renowned golf course architect, Clyde Johnson, used the natural terrain of this former rice plantation to create a beautiful Scottish style Myrtle Beach golf course. Since its opening in 1996, Wachesaw East has garnered many awards and has been a favorite among locals and tourists alike. Wachesaw East played host to the Kathy Ireland/Greens Competition Classic and the LPGA Tour. 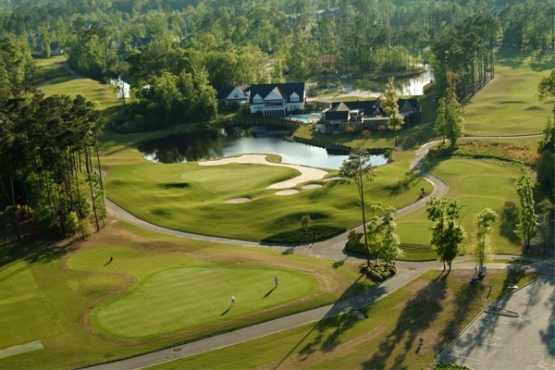 It was also voted the Myrtle Beach Golf Course of the Year in 2007 by the Myrtle Beach Golf Course Owners Association. Built on and old rice plantation, the fairways of this Myrtle Beach golf course wind through the scenic marshes, lakes, strategic bunkers and mounding. The undulating Tif-Eagle greens will true roll on this challenging course. As with many Lowcountry golf courses, Wachesaw East will provide outstanding Myrtle Beach golf photo opportunities. This course will challenge even the expert players, but has several sets of tees to ensure everyone can enjoy this beautiful course and all of its Southern charm. A Myrtle Beach golf package is the best way to get a Myrtle Beach golf deal. Myrtle Beach Golf Authority has long been a leader in booking Myrtle Beach golf packages. They take the hassle out of booking Myrtle Beach tee times as well as other Myrtle Beach entertainment. Book your Myrtle Beach golf package now.